By far the most enchanting part of the Garhwal Himalaya, this sanctuary at 4500 meters is about as close as you can get to nature at its most magnificent. Walking up the fourteen kilometers from Gaurikund in the rain was a substantial challenge. Even the mule sighed in relief when the weight of the back packs was finally off its back. Now it could enjoy its ration of millets and Gur (a form of cane sugar also called Jaggery) before it sets off down hill with yet another load of baggage or human cargo! The GMVN lodge was welcome sight and the cordial atmosphere was dry and inviting. Anybody who has walked substantial distances in the rain can probably rhyme with 'dry'. The bowl of tomato soup did the job of hitting the proverbial hunger spot and was followed by a big helping of the traditional Dal (Lentil) and Bhat (Rice). Up in these mountains even the very basic food tastes as good as gourmet. The lodge was empty and the staff were polite and always ready to help. The roar of the Mandakini seemed next to the bed as it came crashing down the mountain side perpetually headed for the plains. Soon the noise gets tranquil enough to lull anyone to sleep. Five O'clock in the morning and it was as if the mountains had come alive! The fog from the night before had lifted like a veil and the fresh snow on the mountain top reflected the early morning light. Indeed , it was picture perfect and not a word was spoken. The majesty of Nature was apparent before the eye in awesome proportions. It was truly a site to behold. The photographs show only a tiny part of this majesty, as celluloid alone cannot capture what the eye can see and behold. The temple sits in the shadow of the Kedarnath massif (a consortium of three peaks and cornices) and even though a man made entity, has such character, it does not look in the slightest bit out of place. It is as if , it was meant to be there and it has, since the eight century! It is said to have been around in a lesser form during the rein of the Pandava Kings from the epic Mahabharata and is considered one of Lord Shiva's premier abodes. This is, where legend has it, that Bhima one of the Pandava brothers, found Shiva who had disguised himself as a Bull amongst a herd of cattle. Having identified the meanest and most arrogant of the herd as Shiva, Bhima is said to have grabbed him by the hind quarters. What remains in the shrine at Kedarnath is the rear end of the bull, with the rest of its body scattered throughout the Garhwal. 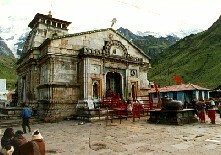 Every year during the months of June-October this temple remains open to pilgrims who come here to offer their prayers. However, very few venture behind the temple courtyard. Bharatekuntha at 6578 Meters, as you see it in the picture on the right, is connected to Kedarnath to the East, by a long and dangerous avalanche ridden ridge. At 6000 meters it looks stunning and has several glacial flows, one of which is the Mandakini glacier running down its ridges. A haven for the technical climber, it presents a daunting challenge to those who wish to get to the top. Kedarnath and Kedardome in the picture on the left, are connected by a deep ridge that also presents some superb ice climbing. 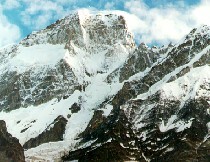 Kedar Dome at 6831 Meters presents a fair challenge and many climbers have succeeded in getting to the summit. 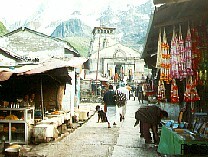 Kedarnath is however, a difficult peak to climb. At 6940 Meters it is just beneath the 'must have oxygen' level. The cornices however, as experienced climbers will tell you, make it a real threat and have prevented many folk from getting to the summit. Anyone interested in a good day trek, could take the well travelled path from behind the temple toward Bharatekuntha. 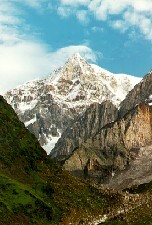 About three kilometers away in the valley formed by the Kedarnath massif, is Chorabhari Tal. This lake has been renamed Gandhi Sarovar after the Mahatma's ashes were immersed in it. Gaurikund was once a lovely hamlet. With the arrival of the bus traffic and the restaurants to cater to the need of the tourists, this place has taken on a terrible look. There is garbage everywhere. The toilet facilities are appalling by any standard. Garhwal Mandal Vikas Nigam (GMVN) makes a decen income off the tourist trade and could well have staffed toilets which could be easily maintained to a decent standard. This is indeed a gruelling trek and some folk may quite easily make the decision to hop on a mule. There are several Chai-Wallahs along the way, who by a remarkable coincidence, are all related to the mule-wallahs. Everything they need for serving up lunch and the traditional Chai, has to be hauled up the mountain. This is indeed a challenge and they live a hard life, with just six months in the year, generating any tangible income. Convenience of having the Chai-wallahs when the tourists need the brew, however poses a threat to nature and the balance it needs to maintain itself. With increasing numbers of tourists getting to the Kedarnath shrine, the destruction to the environment is quite evident. Fuel for the stoves that provide the brew and food burn wood, which is stripped from the trees in the mountains. When questioned, the tree fellers will tell you that they have the permission to cut dead trees. However, the ones they were pushing down the waterfall looked like they were alive and swaying in the himalayan winds, a few hours before the axe felled them. The tree felling also causes landslides which can create obstruction to traffic, as is obvious in the picture to the left. The Public works department manages the road system in this region and is woefully short of funds to buy more than the two bulldozers it has at its disposal to clear the rubble. Usually as the picture indicates, it is manual process using picks and shovels. This is in sharp contrast to the Joshimath to Badrinath road, managed by the military. The Postal facilities in Gaurikund are excellent. Postcards dropped in the mail box got to the UK and the US in six days. Wonder if the boys in Mumbai (formerly Bombay) and Delhi can take the hint! The postcards dropped in the mail boxes at the main Post-Offices there, took three weeks to get to their destination and some are still somewhere in a sorting bin!